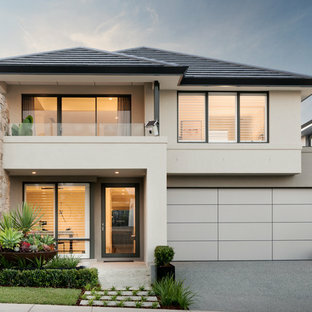 Inspiration for a contemporary two-storey stucco beige exterior in Perth with a hip roof. This is an example of a contemporary two-storey exterior in Perth with mixed siding and a hip roof. 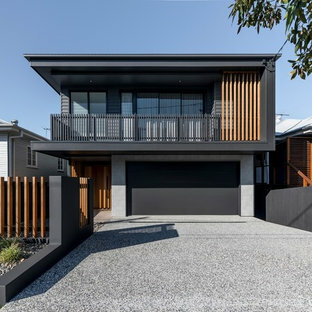 Inspiration for a contemporary two-storey black exterior in Brisbane with mixed siding and a flat roof. 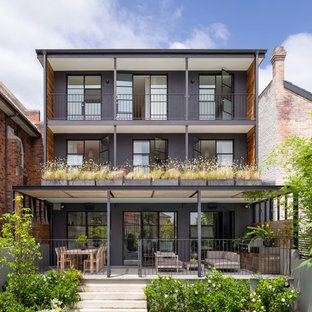 Contemporary black exterior in Sydney with three or more storeys and a flat roof. Design ideas for a contemporary exterior in Sydney. This is an example of a contemporary one-storey brick exterior in Melbourne with a flat roof. 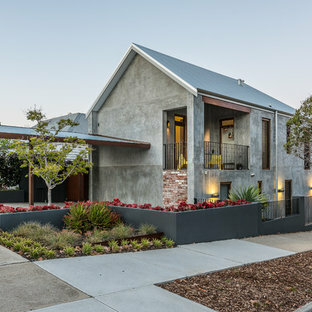 Inspiration for a contemporary two-storey concrete grey exterior in Perth with a gable roof. 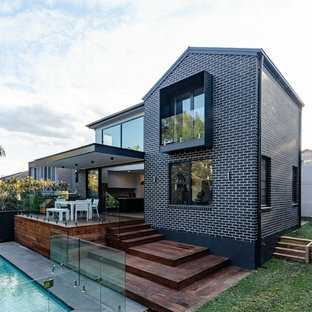 Inspiration for a large contemporary two-storey brick black exterior in Sydney with a gable roof. Amazing design elements in this outdoor living space at our luxury build in the Mornington Peninsula. This beautiful exterior features: Landscaped gardens Feature swimming pool HardiDeck to the Balcony External shower with stainless steel taps 2x 5000L Water Tanks Perfect outdoor entertaining space modern styling and beautiful greenery. This home has such a wow factor that it should be saved in all ideabooks. Inspiration for a contemporary two-storey exterior in Perth with wood siding and a flat roof. 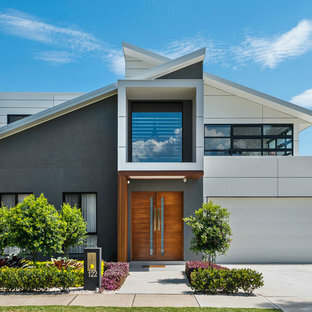 This is an example of a large contemporary two-storey white exterior in Brisbane. Inspiration for a contemporary exterior in Geelong. This is an example of a large contemporary split-level black exterior in Melbourne with metal siding and a flat roof. Inspiration for a contemporary two-storey grey exterior in Perth with mixed siding and a hip roof. Pool and Exterior // The Signature by Metricon Riviera 65, on display in Sorrento, QLD. Design ideas for a contemporary exterior in Gold Coast - Tweed. Expansive contemporary two-storey concrete grey exterior in Melbourne with a flat roof. Photo of a contemporary stucco beige exterior in Perth with three or more storeys. 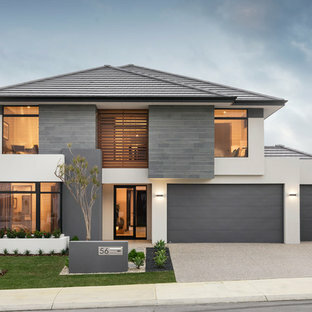 Inspiration for a contemporary split-level grey exterior in Sunshine Coast with a flat roof.